How many times have we seen James Bond jump out of a plane, sans parachute, free-fall while talking on a mobile phone, then gracefully land on the deck of a yacht that just happens to be sailing by? Sounds like a lot of fun. Sure is. But it's about as far from the skydiving truth as possible. Is skydiving safe? The way James Bond does it - not so much. With a parachute and training, definitely. On average, about 35 skydivers - out of two million parachute jumpers, die each year. "If you do everything you're supposed to do during that exhilarating 60-second drop to the ground, you'll be fine," according to soyouwanna.com. Most injuries occur during the landing. The parachute can get tangled, therefore, not provide the full amount of deceleration required for a soft landing. Changes in wind can also force a hard landing. However, above all else, injuries are caused by inexperience combined with over-confidence and/or mis-use of the equipment - all in the name of showboating. As with all physical activities you undertake for the first time, consult your physician before your first skydive. "Although skydiving is not a strenuous sport, people who are in reasonably good shape enjoy it more and are less likely to suffer an injury," according to Skydiving Magazine. "Certain conditions - epilepsy, obesity, heart problems and others might preclude someone from jumping." Some medical conditions that may cause you to post-pone your jump include a cold with sinus congestion - the sudden pressure change from free-fall can injure your ears. If you are more than a few weeks pregnant, it is recommended you not jump. As well, if you have donated blood within the past couple of weeks (longer if you have a small frame), do not skydive. Some over-the-counter and prescription drugs can have undesirable side-effects in high-stress situations and at higher attitudes, due to lack of oxygen, according to Grand Bend SPC. Do you want some liquid courage before your skydive? Forget it. The reputable skydiving organizations will not allow anyone to jump or fly if they have consumed alcohol that day. 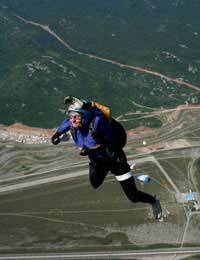 There are four types of jumps a skydiver can do - tandem, static line, static line traditional and accelerated free-fall. Tandem jumping is a great way to get introduced to the sport as it requires little training and the risk is low. The novice jumper is strapped to an experienced instructor, who opens the chute - after a free-fall of several thousand feet - and deals with any emergencies that may arise. The dual control parachute enables the novice to practise controlling the canopy, while the instructor controls the landing. In a static line jump, the novice jumps with a modern square parachute that opens within a few seconds of leaving the plane, via the static line. It is the novice who deals with emergencies and steers the chute to a safe landing. This method demands intensive training and can have a higher injury rate than tandem jumps.Static line - traditional jumping is old-style skydiving - with a round parachute that opens within a few seconds of leaving the aircraft, via the static line. If you are looking for the James Bond experience this type of jumping is for you. These jumps require significant training and have an injury rate of about one per 60 jumps. In an accelerated free-fall (AFF) skydive, the novice jumps with a modern, square chute, but instead of the static line immediately opening the parachute, the skydiver free-falls for several thousand feet before opening the parachute themselves. Throughout the free-fall, the novice is with two experienced instructors who teach in the air, which provides the accelerated learning. So what does it feel like to free-fall? "During a free-fall, most of what you feel is lots of wind and a smaller sensation of pressure against your body. It's more like floating than falling," according to soyouwanna.com. "When you open your chute, it's a different story. Once it opens, it feels like you're being stretched upwards. It doesn't hurt and lasts only about four seconds."